In January 1990, the Mactaggart's woolstore on Skyring St at Newstead caught fire. 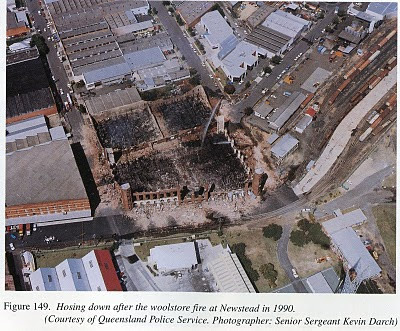 The timber floors, soaked with lanolin from the countless bales of wool that had passed through the woolstore over the years, were extremely flammable, and the building quickly became an inferno with crumbling brick walls that made fighting the fire a nightmare for the valiant firemen who attended the blaze. The building was totally destroyed, and later a person was charged with arson and damage to property. The fire took a long time to burn out and the building smouldered for many hours afterwards. 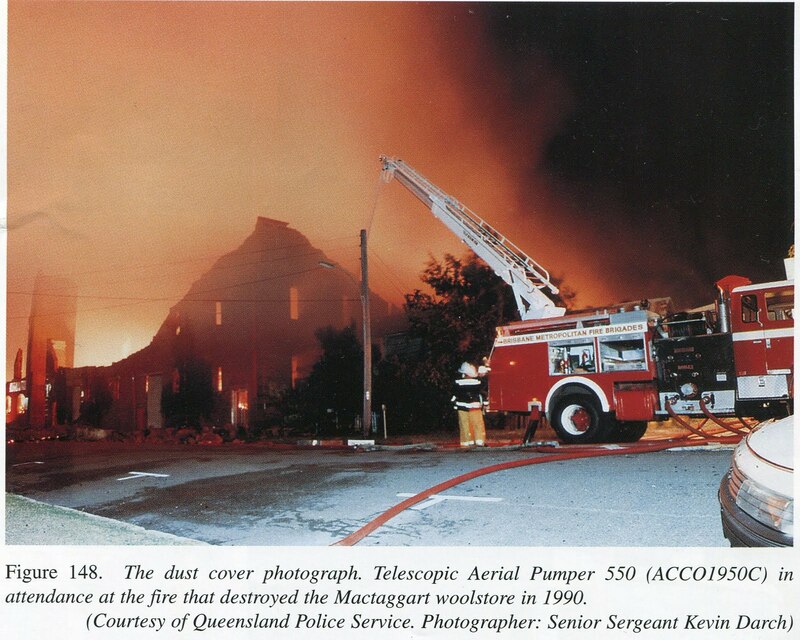 The following picture shows the fire crew still hosing down on the following day, and the devastation caused by the fire is evident in the photograph - click it to see a larger image. The suburb is now known as Teneriffe, and the area previously occupied by the woolstore is now home to an apartment complex called "The Nouvelle". It can be seen in the following image of the area from Google Earth. The old railway sheds across the road have now been removed and the land on which they stood has been "rehabilitated" to allow construction of the Gas Works complex that is already underway.